Hillary Chybinski: our family tree. 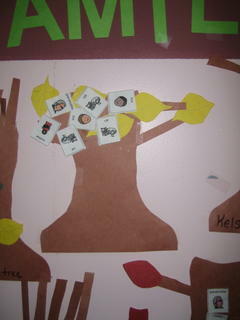 . .
our family tree. . .
. . .according to Ryan. Ryan made this at preschool the other day - he was so proud. he did a great job capturing our three cats. notice that both he and his dad are "boys". i am the mother picture. he also included his grandmom - Mimi. not pop-pop or uncle joe. . .just Mimi. clearly she must be on his mind. . .probably because his birthday is coming up and he knows what an excellent present giver Mimi is. i should find a picture of Mimi and post it. . .she really does ROCK. in fact, everything i know about being a mother, i learned from her. . .and no one's gotten hurt yet. . .love you mommy!